Picket lines are up at downtown Halifax construction sites as crane operators go on strike. Unionized crane and heavy equipment operators on mainland Nova Scotia are on strike after the latest round of contract negotiations failed. The strike, which affects about 100 workers, began Wednesday at midnight. 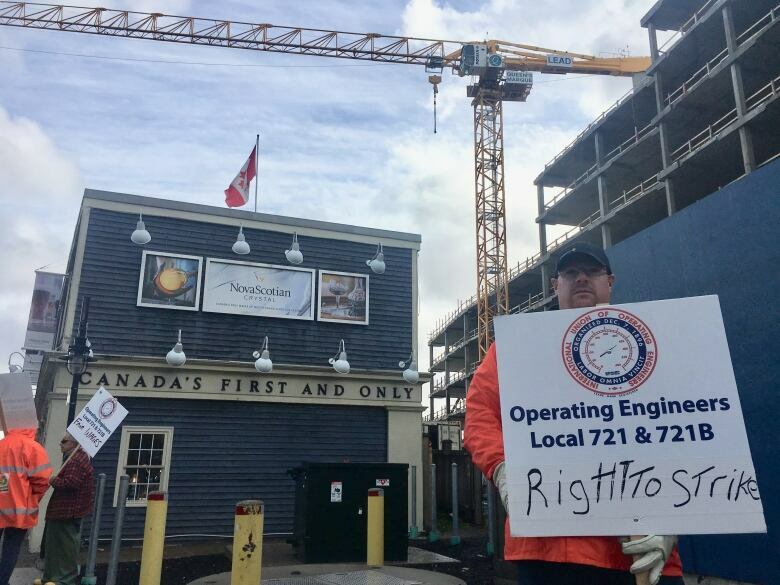 There are two picket lines set up in downtown Halifax — at the Queens Marque and Pavilion condo construction sites. "The tower cranes are going to be sitting idle. And all the material that has to be lifted up there has to go up with the tower crane," Joey MacLellan, president of the International Union of Operating Engineers Local 721, told CBC News. "And you can't bring in a mobile crane to help out on that job site because those guys are all on strike as well." MacLellan said workers are trying to reach a better deal with Construction Labour Relations Association, which represents all of the employers in the unionized sector. Crane operators earn between $42 and $53 an hour, according to the current collective agreement, which expired in April. MacLellan said crane operators are trying to get the same deal ironworkers have. "The crane operators and the ironworkers work hand in hand pretty much every day, so our wages are basically identical," MacLellan said. "We're asking for the same wage settlement as what they achieved and they're refusing to give that to us. They're only offering us basically half of what was offered to them." MacLellan said the strike could last as long as 21 days. After that, he said operators would return to work and take issues to an arbitration panel. "[The panel] will look at the other settlements that were achieved during this round of bargaining and they'll make a decision and impose a binding settlement on the two parties," he said. MacLellan anticipates employers as well as mobile crane rental operations will feel the sting of the strike. "It's hard to get tower crane operators in this province — 85 per cent of them are unionized, so it's hard to find somebody with a ticket in order to run the tower crane," MacLellan said. "Sure there is stuff the other trades can do in the meantime on some of the finished portions that are there, but it will definitely have an impact and slow down the production."